Imagine the following scenario: You’re headed across the mall parking lot after a fun day shopping with your friends. You get in the car, attempt to start the engine and are met with silence. What do you do? A car that fails to start could indicate a number of problems, one of the most common being that the battery has died. If this is the case, you will either need to jump start the car yourself or call and have it towed. Jump starting a car is actually a very simple process, but many people never bother to learn out of fear that they will mess up and shock themselves. Don’t be one of those people! Knowing how to jump start your own car is a very useful skill that can save you a lot of money, and the chances that you will be shocked are actually very low. Any number of things could have caused your car to die, so it’s important to determine what is going on before you attempt a jump start. If you turn the key and hear nothing but silence, the battery is likely the problem. If you hear the engine making cranking sounds, then the problem is of a different nature and you will need to call a tow truck. 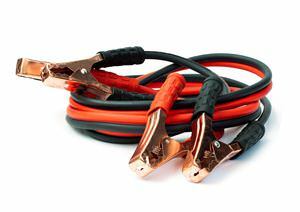 Carrying your own jumper cables will make it easier to find someone willing to take a moment and jump start your car. If you don’t have any, then you will need to find someone who is both willing to help and can provide the cables, which could prove to be a much harder task. If one of your friends isn’t nearby with a vehicle of their own, you will have no choice but to begin asking random strangers. Luckily, most people will have compassion for a driver with a dead battery, especially those who have been in a similar situation themselves. It’s important that neither engine be running when you attempt to attach the cables. Carefully attach one red positive end of the jumper cable to the positive terminal on the dead battery, and attach the other positive end to the positive terminal on the working battery. Next, attach the black negative end to the negative terminal on the working battery, and attach the other negative end to any clean metal surface under the hood of your car, such as the engine block. Never attach the second negative end to the negative terminal on your dead battery as this could cause an explosion. Start the healthy car and allow it to run for a few minutes. Then, turn your own ignition and you should hear the engine start. If this doesn’t happen, the problem lies somewhere other than the battery. If it does, be sure to let the car run for at least 30 minutes to let the battery recharge. Take the time to thank the person who stopped to help you, especially if you used their own jumper cables. In the future, always carry jumper cables in your car. Not only will it benefit you, but you could potentially help someone else out too.